ALPOLIC®/RF provides a polished reflective aluminum surface suitable for many applications that require a high degree of reflectivity. 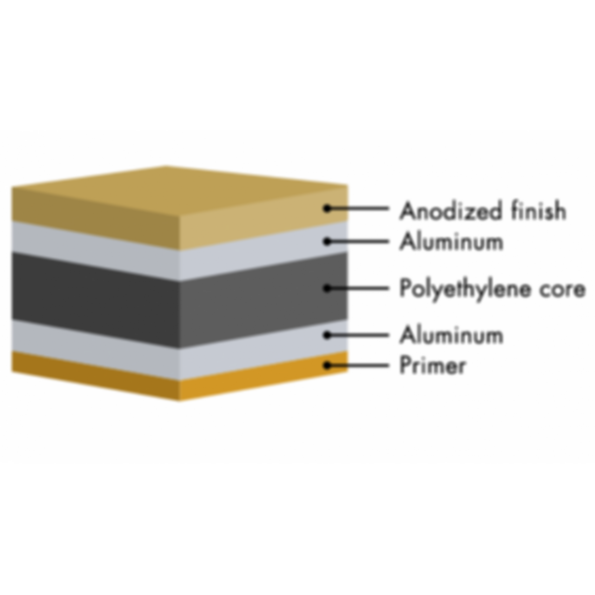 A reflective aluminum panel is bonded to our PE core and backed by a second aluminum panel, creating a panel that's much thinner and lighter than traditional options, much easier to fabricate and mount, and virtually unbreakable. It's the perfect material for any architectural project or practical application where reflectivity is required but a heavy, breakable reflector would be a liability. The anodized reflective aluminum panel bonded to the surface of ALPOLIC®/RF provides a high degree of reflectivity without the liabilities of traditional reflective materials. These highly polished reflective aluminum panels are thinner, lighter in weight and easier to fabricate and mount - and they're shatterproof. They're perfect for any application where high reflectivity is required for the beauty or function of the project, but where the weight, inflexibility, fabrication difficulty or breakability of other reflective materials would be a problem. ALPOLIC®/RF is supplied in 4 x 8-foot panels that are 2mm thick and weigh under 20 pounds each. By contrast, a glass mirror might be 6mm to 8mm thick and weigh 80 to 100 pounds in the same 4 x 8-foot size. ALPOLIC®/RF can be fabricated using ordinary woodworking tools, and can be bent to conform to columns or other curved surfaces. Because it's lightweight and shatterproof, it can be mounted to walls with double-sided VHB tape, a soft mastic such as construction sealant, or simple mechanical fasteners. For all these reasons, it's perfect for locations such as aircraft lavatories, gyms and spas, prisons, retail security and many other applications where a heavy, breakable reflective material can't be safely used. ALPOLIC®/RF is also ideal for reflecting a unique architectural brilliance in interior cladding, sculptural installations and other special projects.